Sirens are a sensitive breed. We point to things just below the surface that shimmer and shine, echoing down down down to the depth of our souls. Deep and dark is our dance. We harp on history under waves of nostalgia. Too much so. Filling our eyes and lodging lumps in our throats. Laughable to some. Downright akin to others. In honor of kinship we’ve rounded up five favorite crafts that speak the unspeakable language of memory…long-gone moments we carry, can barely find words for, though art may have a chance of conveying. Enjoy their innate and understated brilliance, the beauty and bauble and how it all feels here and now. Stroll Williamsburg, Brooklyn, though not the busiest block, and you’ll find the high-beamed gallery of scent-monger Christopher Brosius. The original nose behind once-undergroundish line Demeter (you remember “Dirt”) rules the roost of his own accord since opening his gallery to the public in 2004. Enter and inhale “In The Library,” limited-edition “Gingerbread,” our favorite “Old Leather,” and the note that made Demeter’s “Snow” famous buried somewhere deep in “Winter 1972.” His website is a work of art in itself. Small batches of exquisitely designed notes catapult us back to Italian citrus fields that have no notion of cars, top-hat wearing dandies, fur-toting entrepreneurs, and wintery countesses in full ballroom regalia. Sold online and internationally, and heavily Brooklyn-based. Thank Heavens. Curanderas are traditional Latin American healers who serve their communities as doctors, healers and psychiatrists. Founder Josie writes “Living and working in urban metropolises can deplete us of vitality, heart, and spirit. Curandera NYC addresses the major urban ailments of this lifestyle — monkey-mind, stress & lack of spirit.” This capsule collection of hand-crafted, plant -based folk remedies includes tinctures, essential oil blends, healing balms and unique body essentials on Etsy. We have a small vile of Shiva for dancing and Woodland stashed for escaping. 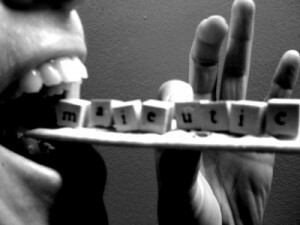 ma·ieu·tic: adj. Relating to or resembling the Socratic method of eliciting new ideas from another. To paraphrase: to give birth to new ideas. These and other re-found words affix to reclaimed wood taken from Brooklyn watertowers, Coney Island boardwalks, and pickle and wine tanks in the form of magnets. Two artists (Nicola and the Newfoundlander) craft resurrection and redesign. When hunting for that perfect piece of whatever hidden way back on the second or third shelf in the fridge, don’t chalk it up to an undignified episode of scavenging. Consider urt: a little leftover chunk of something. Each season brings different designs in a kitchen keeping things close to home with locally-sourced, high-quality ingredients from small producers. As if the chef visits neighbor after neighbor asking “What’s good?” and brings baskets back filled with whatever is freshest and fairest that very day. Long tables and benches best serve family-style eating while pots and pans clang in an open kitchen. Their website states: Eat’s mission is to promote and preserve a handmade life. This does not just include food. All of our furniture, metal work and ceramics are made by owner Jordan Colón and other regional artisans. They sell wood-fired pottery, too.